where u solves the structure equation for the control and is a fixed value. Our aim is to find a control which minimizes the payoff criterion. And therefore we find u the beam displacement, v the velocity of the fluid and p the pressure of the fluid. Problem involved in fluid structure interactions occur in a wide variety of engineering problem and therefore have attracted the interest of many investigations from different engineering disciplines. As results, much effort has gone into the development of general computational method for fluid structure system by Osses, Fernandez, Quarteroni, Blouza [1-5]. This paper aims at showing a new method to solve fluid structure interaction problem. Our computational method is based on controllability approach. We suppose now that the external force of the structure depends upon some control parameters belonging to a set K, where K denotes the collection of all admissible controls. We define a payoff functional J. Given a target displacement does there exist a control steering the structural displacement u to . We shall now concern ourselves with minimize the functional such that the coupled problem is achievable. To find the optimal control implies the calculus of the displacement u, the velocity of the fluid v and the pressure of the fluid p. The fluid is modeled by two dimensional Stokes equations for steady flow and the structure is represented by the one dimensional beam equation. A former paper has shown both existence and uniqueness solution of the coupled problem Grandmont . We denote by the two dimensional domain occupied by the fluid, the elastic interface between fluid and structure and be the remaining external boundaries of the fluid as depicted in Figure 1. defines the reference domain. where u is the displacement of the structure, fS is the external force of the structure, E is the young modulus and I is the moment of inertia. This equation is good representation of the structure for small deformation. Figure 1. Sets appearing to the fluid structure problem. where v denotes the fluid velocity, p denotes the pressure, fF denotes the volume force of the fluid, μ the viscosity of the fluid and g denotes the velocity profil of the fluid imposed on the rigid boundary. We have a fluid structure interaction problem. The domain of the fluid depends on the displacement and the displacement depends on the velocity and the pressure of the fluid. where u solves the beam equation for the control λ, the target displacement and the real are given. Given a target displacement of the structure, we will find a control steering the displacement u to . Our aim is to find a control which minimizes the payoff (J) subject to Equations (14)-(19). The weak formulation of the fluid and the structure is given by Grandmont and Murea [6,7]. Thanks to the function BFGS we solve complex nonlinear optimization problem within FreeFem++ Hecht . To solve the problem by the quasi-Newton BFGS method we need the derivative of with respect to . • Step 4: To minimize J we use the BFGS method. The existence of the optimal control gives the displacement of the structure u, the velocity of the fluid v and its pressure p. In this step, for each iteration we solve Stokes equation in the moving domain and we compute also the displacement u.
Parameter related to fluid: The viscosity of the blood is , its density is , the length of the vessel is , the half width of the vessel is and the volume force in the fluid is . Parameter related to structure: The thickness of the vessel is h = 0.1 cm, its Young modulus is , and its moment of inertia is . We assume that the velocity on the boundary fluid domain is such that and for all in . The value of is tested corresponding to the external value of a real pulsatile blood flow, for the computation of the gradient. This given control is and we take . We use the P2 Lagrange finite element to approach the velocities and P1 Lagrange finite element is used to approach the pressure. FreeFem++ is used for numerical tests. Table 1. Payoff functional and control for 5 iterations. Figure 2. Fluid velocity and structure displacement. wave, the fluid flow and the displacement of the structure are on good behavior. On the one hand, the advantage of the method compared to Mbaye and Murea [9,10] is that we don’t need to approximate the pressure on the interface by a linear combination of functions and compute the analytic solution of the structure equation. The fact that we don’t need to increase the number of controls in order to obtain good results Murea , is another advantage of this method on the other hand. To improve our paper, we will introduce in a future work an analytic derivative of the cost function with respect to control. 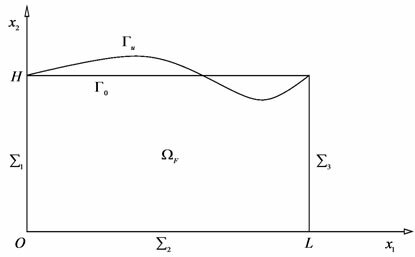 In this work, a new numerical method based on the controllability approach is used to solve fluid structure interaction problem. Our method gives good results when the displacement is small. After five iterations we reach the solution of the coupled problem. In a forthcoming work, the technique used here will be adapted to solve the unsteady fluid structure interaction problem. The author wish to thank Professor Djaraf Seck for fruitful discussion on this subject. M. A. Fernandez and M. Moubachir, “And Exact Block Newton Algorithm for Solving Fluid Structure Interaction Problem,” Comptes Rendus de l’Academie des Sciences de Paris, Series I, Vol. 336, 2003, pp. 681-686.